These super simple Candy Corn Jello cups will make for an easy and fun fall & Halloween treat for everyone! Halloween is so fun to prepare for! In our house, we like to get as much as we can out of everything. We love the colors, the scents, and the scenery of everything fall related. 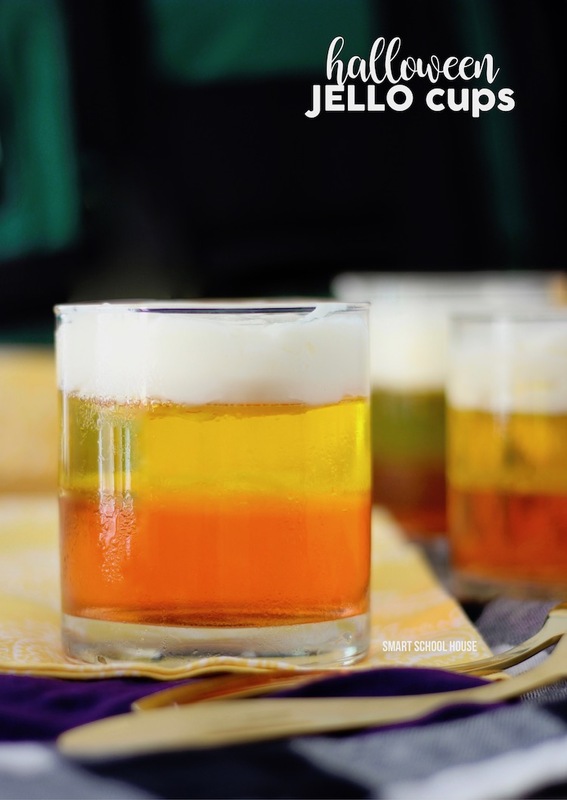 Even if you’re not a candy corn lover, you’ll still love this candy corn jello layered treat! The colors are candy corn, but the taste is not. Gather a small collection clear cups (any size you like) and whip up a fun party treat for kids and adults. Looking for more Halloween recipes? For this recipe, refer to the “speed set” directions as seen on the Jello box. If you need more time, you can prepare it the traditional way. But, we will be using the quick set method. Some boxes of Jello are larger than others, so the amount of water and ice you will use may vary depending on the size box you have. Prepare the orange Jello according to the “speed set” directions on the box. You’ll need boiling water, regular temperature water, ice, a bowl, a spoon, and a measuring cup. Once the orange Jello is mixed and ready, pour it into clear glass cups about 1/3 if the way up. Place the cups on a flat surface in the refrigerator. Let the orange Jello set in the refrigerator for 90 minutes. While the orange Jello is in the refrigerator, prepare the white pudding according to the directions on the box using milk and an electric mixer. Place the pudding in the refrigerator. Once the orange Jello is firm, start preparing the yellow jello with boiling water, ice, and a mixing bowl. 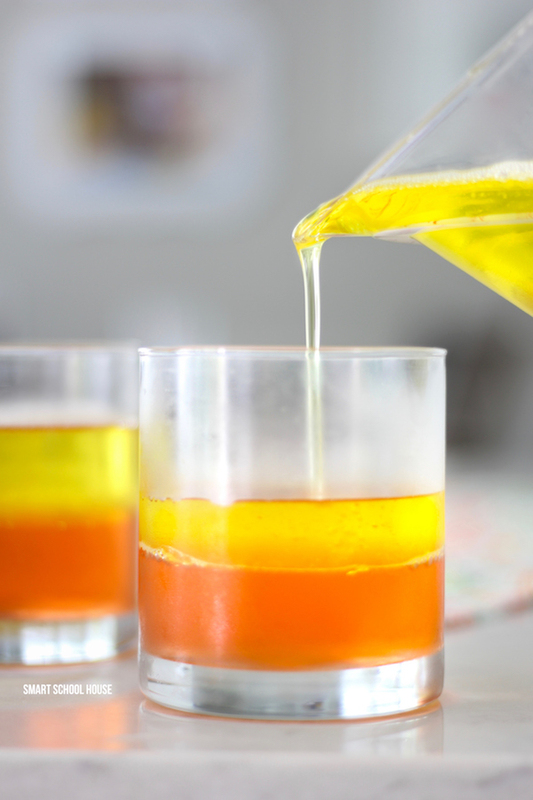 Slowly pour the liquid yellow Jello on top of the firm orange Jello until about 2/3 of the cup is full. Return the cups the the refrigerator for another 90 minutes. After the yellow Jello is firm, gently place the white jello on top! The process takes a little time and patients, but the result is so fun and festive! 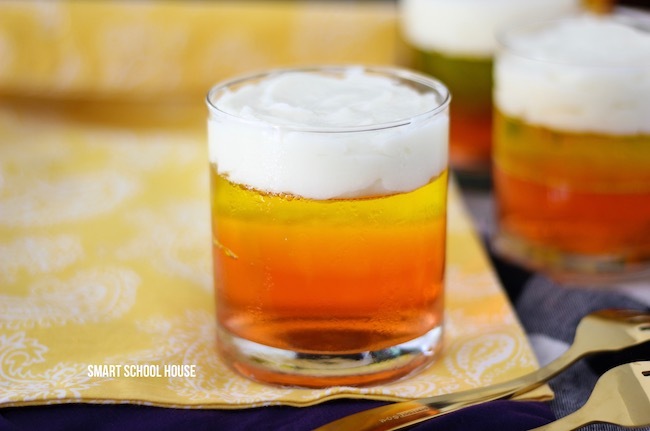 Who wouldn’t love a cold cup of Candy Corn Jello pudding in the fall? The pudding is rich and creamy while the Jello is full of jiggly fun!